In the jungle of Aceh, parakeet birds live peacefully with their wise king. However, now their peaceful life is disturbed. A hunter goes into their jungle and plans to catch them. It's a beautiful morning. The parakeets and their king perch on a branch of tree. They do not know that the hunter is hiding. The hunter wants to catch the parakeets with his net. The hunter throws his net towards the parakeets. Some parakeets and the parakeet king are caught under the net. The parakeets are scared but the parakeet king tells them what to do. "Relax. I have a plan. We all pretend to be dead. 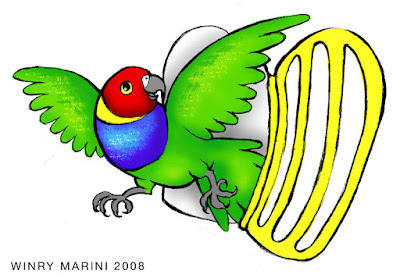 When the hunter lifts the net up, we fly fast to the sky," advise the parakeet king. The hunter goes to his net. He is upset! He thinks all the parakeets are dead. "Oh no! I can't sell dead birds to people." He then lifts the net up. Not long after that, the parakeets free themselves and fly to the sky. But the parakeet king is still trapped. He does not want to fly to the sky until the parakeets are free. The hunter is surprised when he sees the parakeets are flying. He sees there is one parakeet left in the net. "Gotcha!" he catches the parakeet king. And then the hunter goes home. He puts the parakeet king in a birdcage. In the jungle, all the parakeets are sad because their king is locked in a birdcage. They set a plan to free their king. All the parakeets fly to the hunter's house. With their beaks, the parakeets peck the birdcage. Slow but sure, the birdcage is destroyed. Then the parakeet king can free himself.